With the economy thriving, this year’s AD Design Show, held from March 22 to 25 in New York City, seemed to throw caution to the wind and state that more can be more. Gold and brass details abounded, colors were vivid and dramatic, and organic shapes, luxe materials, and ornamentation added buzz and bling to many of the booths. As in previous years, some 400 product brands exhibited in three loosely defined areas: Refresh, a showcase of kitchen and bath wares, high-end appliances, and building products; Furnish, which covers furniture, lighting, carpets, textiles, and decorative accessories and art; and Made, a gallery of handcrafted furniture, accessories, and art by artisans and artists, more than half of whom were new to the fair this year. Also new to the show, the Associative Design installation offered contemporary furniture, lighting and art objects by Portuguese designers, while Designer Focus featured vignettes by Joshua David Home, Circa Interiors, Current, and Christopher Architecture and Interiors. 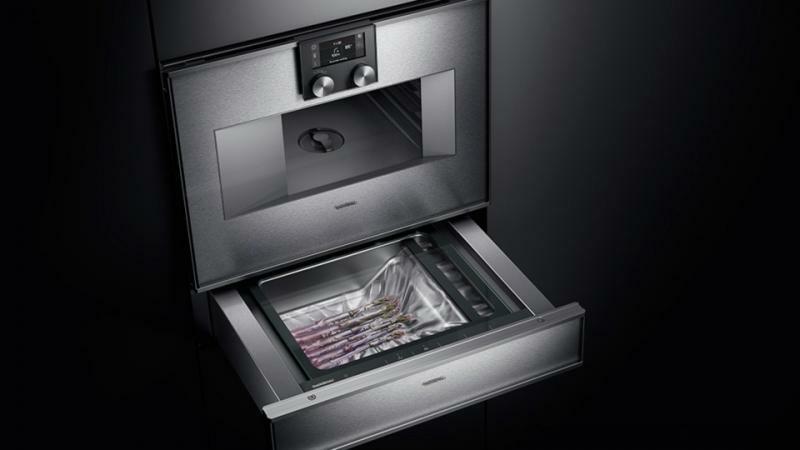 Designed to integrate with the 400 series ovens, Gaggenau’s new vacuum drawer provides quick and easy sealing of food items for sous-vide cooking, marinating, and extended storage. Measuring 24 inches by 5½ inches by 8 9/32 inches, it offers three levels of oxygen extract and heat-sealing to accommodate bags in vary thicknesses. 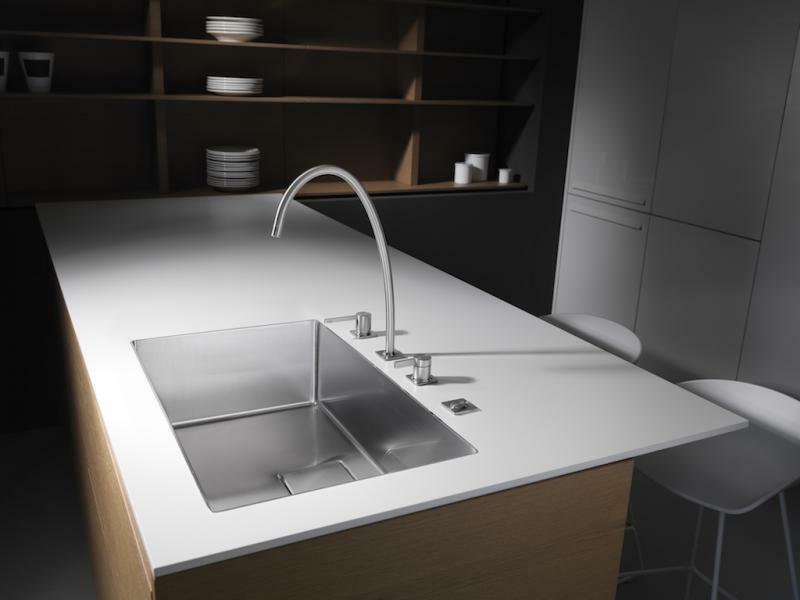 The Crystal Collection by Franke is a line of coordinating sinks and faucets, both of which feature a shatterproof glass panel in black or white. On the sinks, the panel functions as a cover to obscure a corner drain, while on the pro-style faucets, it accents the base and the arm. 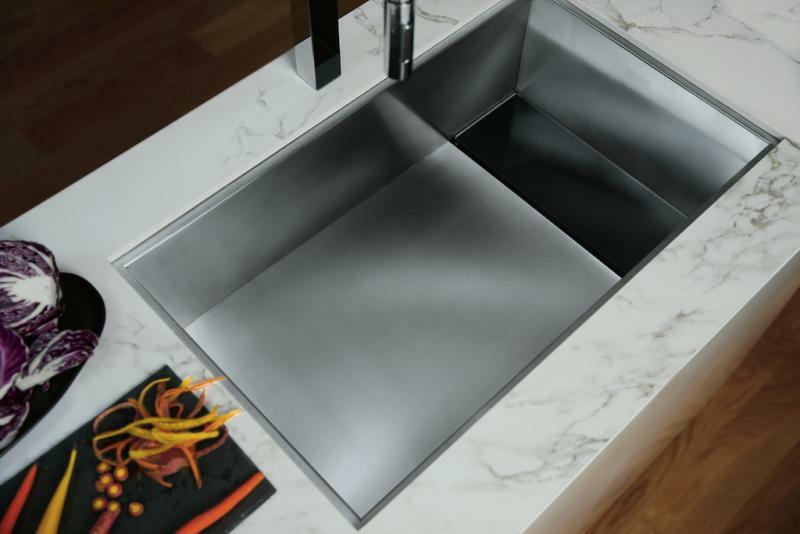 The line includes single- and double-bowl sinks with a choice of left or right side drain and a drain board. 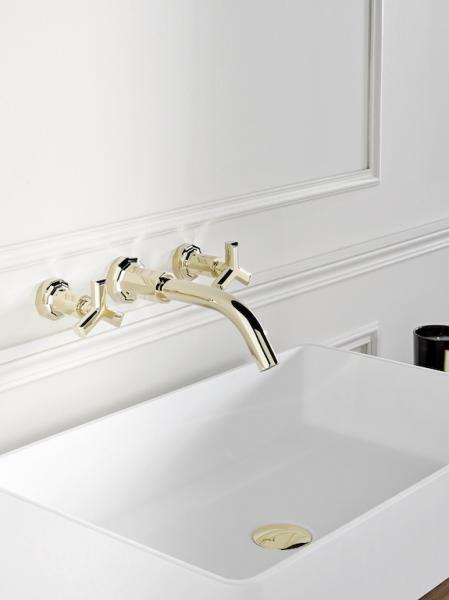 KWC’s Era kitchen faucet turned heads with its ultra-slim, ultra-sleek profile. Measuring only 18 millimeters in diameter, it comes in four spout designs: Pull-Out Spray, L-Spout, J-Spout, and Gravity Spout (shown). With the exception of pullout, all are equipped with swivel spouts that can rotate 150 degrees or 360 degrees. The faucets will be available in third quarter of 2018. 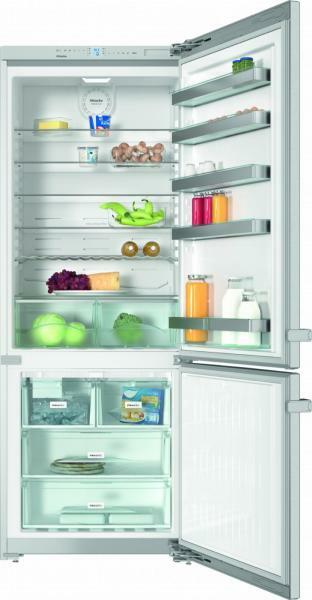 Miele debuted its first freestanding refrigerator, a 30-inch bottom-mount model (KFN 15943 DE). Energy Star-rated, it features fingerprint-resistant CleanTouch steel doors with soft-close functionality and an LED-illuminated interior. The freezer includes an icemaker and DynaCool technology for optimal air circulation and distribution. 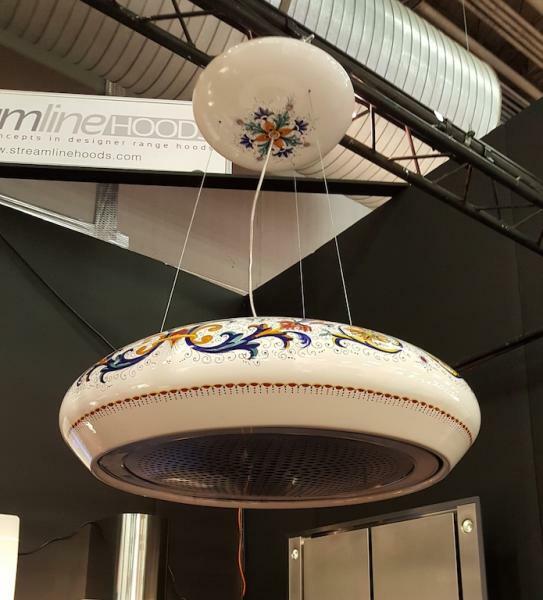 Streamline Hoods showed a 375-cfm air recirculation system with a hand-painted ceramic shell. Measuring 27¼ inches in diameter and 8¼ inches high, it is equipped with 20-watt LED lighting, a washable carbon filter, and a stainless-steel filter. It operates at a sound level of 68 decibels. 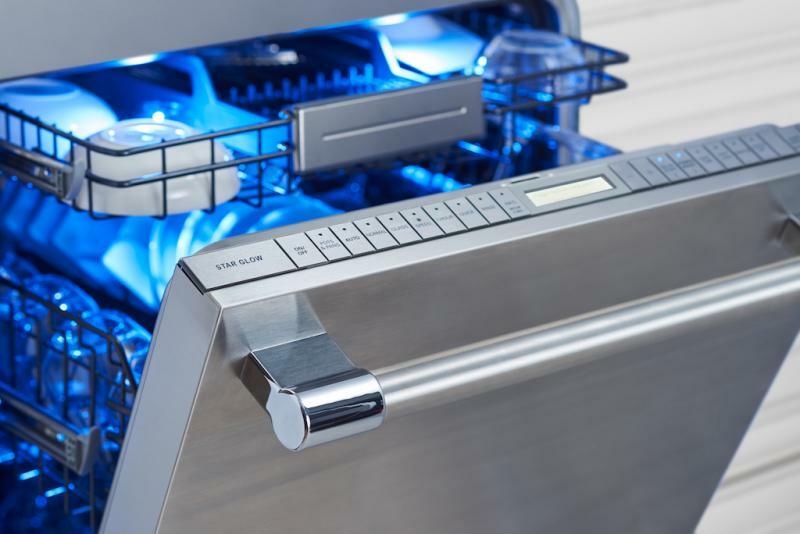 Thermador’s Star-Sapphire dishwasher features StarDry with Zeolite, an additional step at the end of the drying cycle, which uses naturally occurring mineral to ensure thorough drying of items. The mineral, which emits heat when wet, is contained in a section of the dishwasher’s wall. Also included are Star Speed, a 20-minute hot water cycle, and an Entertainer Drawer, which provides 2 inches of clearance for items that are typically hand-washed. Designed by Gilles & Boissier for THG, Les Ondes is a collection of classically modern sink and tub faucets with a 10-faceted base and a trident-shaped brace. Both sink and tub faucets come in deck-mounted and wall-mounted styles with cross or lever handles. The line also includes shower trims and coordinating accessories. A variety of finishes are available. 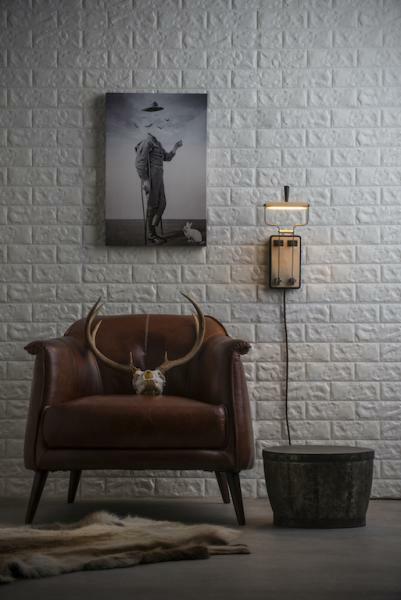 Vermont Modern’s Old Sparky is a quirky task light that is turned on and off by moving the handle up or down. It measures 17 inches by 7 2/5 inches, takes a 6-watt 2700K LED, and is available as a desk lamp or a sconce. 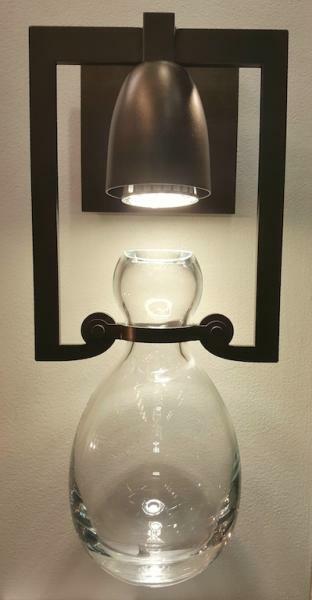 Hubbardton Forge’s Apothecary Sconce features a hand-blown glass globule illuminated from above by a 35-watt MR16. The fixture measures about 14 by 6 by 5 inches and is available in six metallic finishes. The collection also includes a mini pendant and five-light pendant.